some good and others difficult. It seems these years have been a bit of passing of the baton to the younger working dogs, again involving some great moments and some unpleasant sad times. 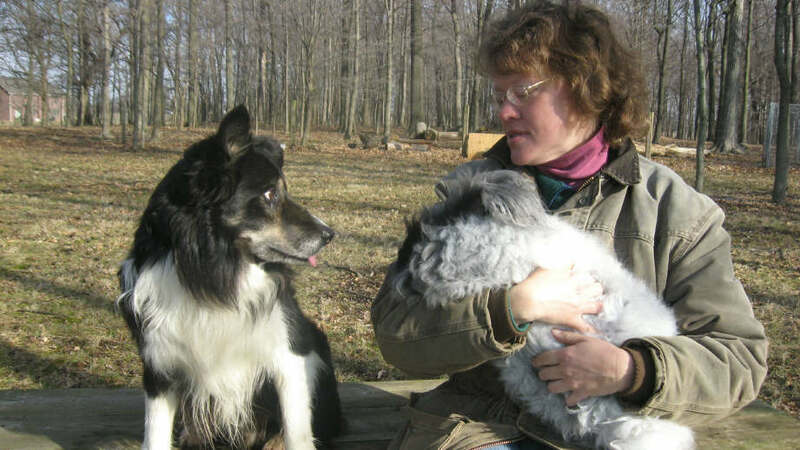 The two Border Collies that helped me begin this journey are no longer here, Luke and Lad. I miss them both and am sure they will always be missed. Scott and Meg have both come into their own and are continually developing into great working partners, each has their strengths and challenges. I have discovered it is my job to assist them in areas where they need help and enjoy those things they do so well. Meg is queen at lambing, that quiet confidence and her straightforward approach to work allows the ewes to relax simply moving where she directs. Her enjoyment of working with any lamb makes me smile. Her lamb addiction only seems to grow. Scott has developed other gears than full steam ahead which is nice to see, the sheep appreciate it I am sure. He is the go to boy with the big flock where he can use all that push and come forward. Blu is slowing down as the young ones are coming up. It is as it should be but a bit difficult for me and possibly a bit tough for him. I save the easy jobs for him. I relish those days where he and I can go out together and do all the chores together. Our connection is beyond explanation. I only hope his quiet calm control of sheep and his devout willingness to do whatever I need - even when I do not know what I need - somehow rubs off on the other dogs as they gain experience. In these years puppies have come and gone which again hold joy and some sadness. Each dog I take to sheep teaches me something, I am grateful. There have been days of working pups where I wonder what the heck is happening and days of stellar work that I watch in awe, hopefully I continue to learn and grow from them all. This year has been warm, spring came a month early. It was nice to have grass early to be able to save on hay and get the sheep out to pasture. Even Ace, my old ranch gelding, is picking up weight this year. THe warmer weather has allowed me to keep working the dogs and they are all coming along. Meg has been helping with chores. I love to see thinking and figuring things out. So far I haven't ask her to do anything that we haven't been able to get done. Blu isn't so happy about her taking his chores from him I am afraid. Scott is stepping up as well and Loves holding sheep against a fence for me to doctor or sort so he gets those jobs. Haven't yet used him on many ewes and lambs yet, there will time for that. Yippie Finally get to pick up Grace from the airport. Hard to believe she will be here, it seems like I have been looking forward to her arrival for a long time. Jack Knox came in mid April for a two clinic. Lots of new handlers here for that clinic. The weather was cool and we missed the rain, everyone learned a lot and had a good time. It is always a pleasure to work with Jack. I am grateful for him sharing his wisdom. I have had several folks coming for lessons and that has been a challenge I have enjoyed. I hope it remains cool for awhile so everyone can continue to make progress. The dogs are always teaching me things if I take the time to listen. We had some cold weather over the winter but not the snow like last year. Lambing has gone well so far which is always a good thing. Blu and Gem are both working well and I have been getting the young dogs out more to work. April has brought warmer weather but lots of rain and storms. Bobby Dalziel came for a 5 day clinic and we all learned a bunch. Bobby's method sure works well for the dogs keeping things positive and giving them confidence while we remain in control. I started Meg, what a little working machine she is. She has great style already and is all business when she is working. I have to remind myself she is only 6 months old. I attended several trials in 2010 running Blu and Gem. We came home learning something every time and enjoyed ourselves. We trialed in IL and WI, attending several trails for the first time. I also hosted Thad Buckler for a clinic. Gem had her first litter of pups for me in October so several folks enjoyed Christmas puppies. Meg is my girl from the litter. I am looking forward to getting her on sheep in the spring. It seemed spring was a long time coming this year, when it did get here it was hotter than normal. Lambing was a bit rough because of the late snows but April brought some grass and drier weather. April also ushered in the first of my clinics for 2010. Jack Knox again helped folks with their dogs over Easter weekend. Couldn't think of a better way to begin springtime than spending it learning and working dogs. I took a trip up toward Chicago in April as well to deliver a pup I sold and attended Bobby Dalziel clinic while I was up there. It was great to meet some new folks and spend several days away with the dogs. 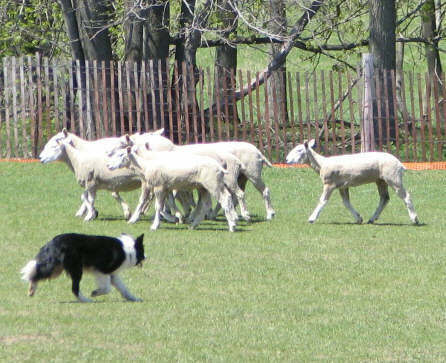 The clinic was quite enjoyable and all the dogs I took got some work holding sheep for the young dogs entered in the clinic. I gave Karin Soderberg Gem to work. 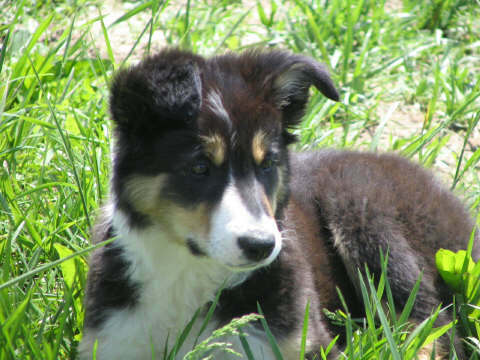 Karin had been in the states several weeks and was going into "Working Border Collie Withdraws." I can relate, a few days not working the dogs I begin to go crazy. May brought the Bluegrass and this year I entered BLU in open. I was more than a bit intimidated walking out onto that field but Blu took care of things for me. Our first run was a bit all over place and I just couldn't get the sheep lined out but did manage to get around the course, shed and pen. The second run was much better and Blu had the sheep lined out this time and we looked like maybe we belonged on that field. We ended up in the top 1/3 of the 134 open dogs so I am really pleased with how we did. I was just sure if we could have one more go we could do even better....next year. May also brought Kevin Evans back to my place for his second clinic. He never ceases to amaze me. There is simply something about him that the dogs respond to immediately, add to that he is a great teacher and the clinic was a blast. The only thing I would change was the heat - added a bit of a challenge in the afternoons but we all hung in there. Kevin is most likely the tannest man in Wales. What a great group of folks and dogs. The winter began slowly and we hit another couple trials. Bear did really well running Pro Novice and Blu and I ran in a double lift open trial and completed the course. Yeah for us. The winter turned rather cold and snowy after Christmas, but I continued to work the dogs. We are continuing working on those things that we need to polish and looking forward to more fun on the trial field. Jack Knox is coming in July for his second clinic and everyone is gearing up for that. I am busy getting everything ready so we can all have a super time at the clinic. I am also looking forward to puppies arriving the end of July or first of August. This will be Lad's second litter and AJ's first. I am really enjoying Bear, who is out of Lad's first litter, so I am hoping there will be a cute little female pup that catches my eye and will grow up to have the heart of her sire. We had quite a few trial successes this summer. Blu did well on his Ranch run at the Horse park trial and Bear completed both his Novice runs. Things are also set in motion to continue having wonderful clinicians here. Kevin Evans and Aled Owen will both be here in Oct of 2009. The second Jack Knox clinic is now history. What a time we had!! There was a great group of folks attending that made the clinic super fun. 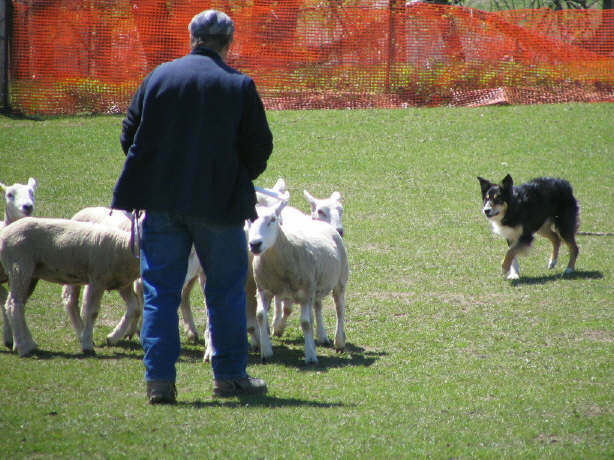 There were folks new to herding and others that had sheep at home and wanted some help with training their dog and some folks who are trialing who came to fine tune some things. The weather cooperated with cooler than normal temps. Thanks to everyone who came and made the clinic possible. A special thanks to Jack for sharing his insights with us and always wanting the best for our dogs. Can't wait till Jack returns next year again. I took my boys and attended an intensive training course for Canine Massage. I think Lad, Blu and Bear enjoyed it more than I did. Who wouldn't enjoy being massaged for several hours a day? I am now Certified in Canine Massage which is a great compliment to my Veterinary Technician Degree. I can now add massage to my grooming services and obedience training that I currently offer. 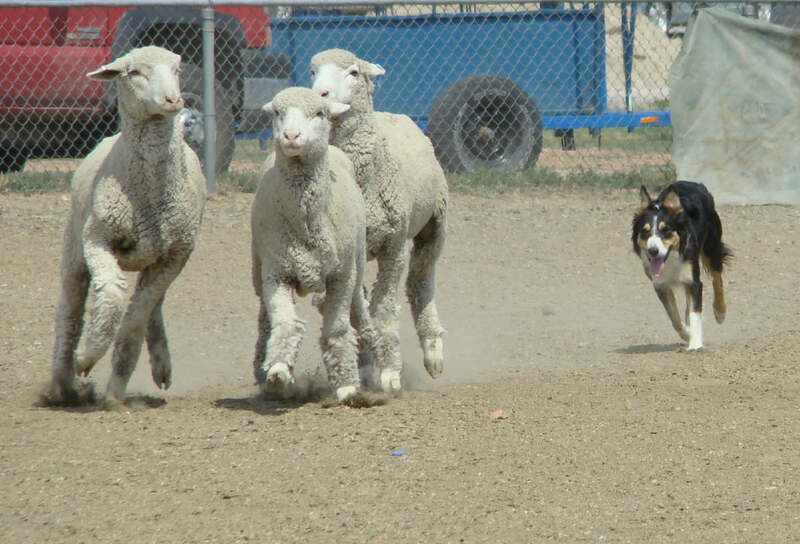 I have begun offering Herding Lessons due to the requests of several folks that have attended clinics and my demos. It is really exciting to be able to help folks that are just starting out and witness the progress they and their dogs are making. It is also a great learning experience for me. 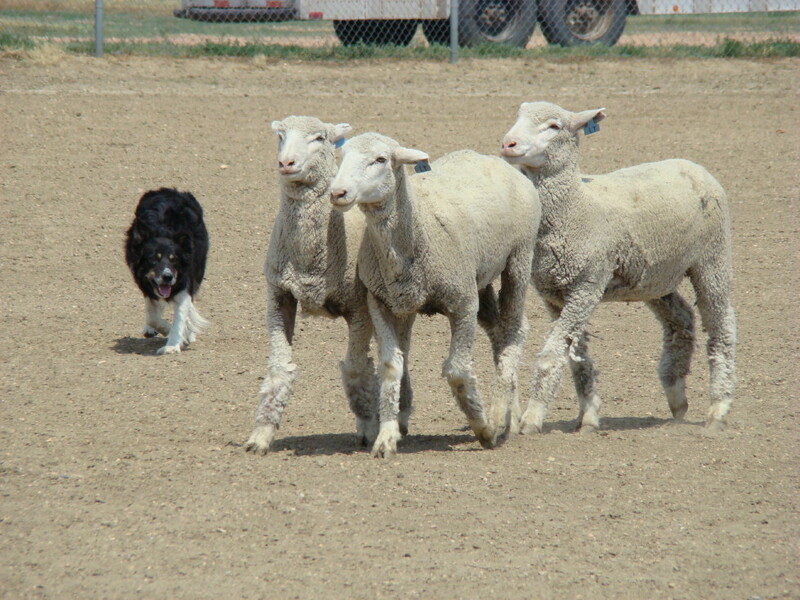 I am working with breeds other than Border Collies which adds another challenge. These dogs always are teaching us if we are willing to open up our minds and willingly listen. The boys and I attended a few trials this spring. We tired our hand at a ASCA trial and enjoyed ourselves very much. Blu had a really nice run the second day complete with compliments from the judges and clapping from the crowd. He scored 119 out of 125 and was awarded high point in trial ribbon. Bear did very well also moving up from Started to Open and scoring 106 out of 125. We went to several USBCHA trials as well. We ran at the Bluegrass for the first time. The scores were not great but I was pleased to be there. The OVSDA trial at the Horsepark went well for us. Blu had his first Ranch run and made every panel and the pen on Saturday. I was very thrilled. Bear and I finally completed a Novice course with a really nice pen. I haven't been to trial in quite awhile and figured it was past time to see if all those hours working the dogs was beginning to pay off. I was only able to attend one day but I wanted to support Connie and the Bluegrass. I knew Blu was ready and that he would do reasonably well. Bear, since he is young, I didn't have huge expectations. I wanted it to be a positive learning experience for both Bear and myself. I ran Blu in Pro Novice and he/we did very well. I was asked when my run was finished how we did. I said "We Rocked" We won that day of Pro Novice. Bears run didn't go so well, he just needs some miles and experience. I invited Patrick to give a clinic at my place at the end of October. We had handlers come from IN, KY, MI, and VA with dogs of all ages. Most dogs were Border Collies but we also had a few very nice Australian Shepherds. I borrowed some more young lambs for the clinic and we had sheep for every situation possible. We had a variety of different places to work the dogs so everyone was able to have productive sessions. Patrick gave everyone insightful advise to help us with our dogs. He is able to see where the team needed help and always had suggestions that were immediately effective. Everyone left having made some new friends and learned a ton. I am sure we will have Patrick back in 2009 for another clinic. I can't speak for everyone else but I know I will need Patrick to share more insights so I can improve as a trainer and handler. If you get an opportunity to attend one of his clinics I know each person that was here would encourage you to do so. I headed out to the National Finals in Sturgis, SD to spend the week watching some great runs, enjoying getting together with friends and volunteering. The weather couldn't have been better. I spent the following week visiting with some friends out west and working the dogs. Bear had his first exposure to working a large group of range ewes in the wide open pastures of SD. He did very well and I couldn't have been more pleased. I think he is really going to be a super dog. The summer of 2008 was spent doing alot of training in the mornings. All the dogs are improving and I am also figuring a few things out myself. Most days I am sure I am the one who needs training, everything comes so naturally to them. the clinic much more than the dogs did. Derrick has a way with the dogs that is simply amazing. We all took a trip to Indianapolis to visit a friend and her family and spend a bit of time working the dogs in different surrounding with different sheep. Everyone had a great time. Lad was very surprised that he actually met the Easter Bunny - aka Jack. L & M Star had her litter of puppies on February 12, 2007. She did a super job with her first litter. Labor began mid afternoon and by early evening there were 7 healthy puppies; 3 males and 4 females. Lad and I traveled to southeastern OH to participate in the cattle and sheep trial. It was super cold, luckily the trial is indoors. Lad did well, he placed with both cattle and sheep. I loaded up Lad, Star, and AJ and headed to River Falls, WI for a 5 day training clinic at Kensmuir Training Center. There were folks from all across the country with dogs at all levels of training. I learned a bunch and had a super time. All three of the dogs did very well. On the road again - Lad, Star, AJ and I headed west 1300 miles to west central South Dakota. We arrived early to get settled and help set up for the trial. The ewes and lambs were very challenging and such great experience for the dogs and I. This trial was only a few hundred miles from the SD trial so we headed a bit further west to enjoy this trial in Wright, Wy. Star ran in Novice and she did well for this being her 4th trial. Lad ran in Intermediate and won his class. He trotted the sheep around the course like a true gentleman. 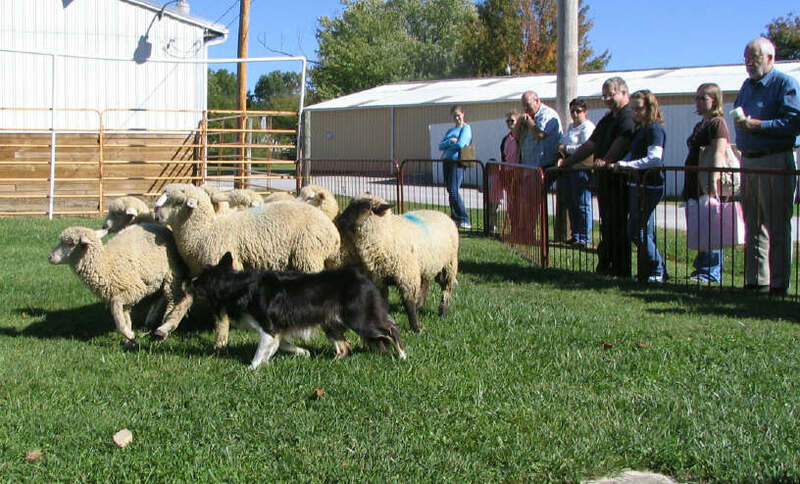 I was asked to attend this annual fiber festival in Corydon, Indiana and give everyone a herding demonstration. I loaded up my lambs and all the dogs and we made the 100 mile trip on a very nice fall day. The pups traveled in crates in the rear half of the livestock trailer which they were not thrilled about but taking 7 dogs left me little choice. Lad moved the lambs from the trailer across the fairgrounds and into the arena. As usual he Stole the Show and wandered around the displays with me when we were not "working." I began the demo showing off Lad then it was the pups turn. This was their first experience working livestock away from home. The pups were 7 months old and could not have done any better. They had never seen so many people before but once they went in to the pen with the lambs the true nature of the border collie was evident and they were ready to concentrate on the lambs. Star and AJ then had their turn to show off for everyone. We all had a great time and were asked to come back next year. AJ and the pups continued their training as much as possible through the winter. We had some "Snow Days" which the dogs enjoyed as much as the school kids.